Here is the Hyundai Creta compact SUV in Premium Red Passion Color variant makes it stunning and vibrant among nine 2018 Hyundai Creta Colors. Above is the photo of 2018 Creta in Red Passion Color Variant. 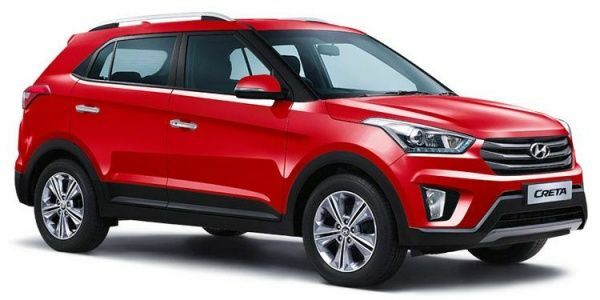 2018 Hyundai Creta is made available in Red Color (Red Passion). Check out the Hyundai Creta in Polar White Color variant which brings pleasure and perfection. Above is the photo of 2018 Creta in Polar White Color Variant. 2018 Hyundai Creta is made available in White Color (Polar White). A passionate sporty Phantom Black. Check out the Hyundai Creta in Phantom Black Color variant. Above is the photo of 2018 Creta in Phantom Black Color Variant. 2018 Hyundai Creta is made available in Black Color ( Phantom Black). A mild and soothing color, Yes it’s Blue. Check out the Hyundai Creta in Mystic Blue Color variant. Above is the photo of 2018 Creta in Mystic Blue Color Variant. 2018 Hyundai Creta is made available in Blue Color ( Mystic Blue). Check out the Hyundai Creta in Sleek Silver Color variant which is similar to white with a bit shiny glossy feel. Above is the photo of 2018 Creta in Sleek Silver Color Variant. 2018 Hyundai Creta is made available in Silver Color (Sleek Silver). Here is the Hyundai Creta in Earth Brown Color variant which adds on to the elegance of the vehicle. Above is the photo of 2018 Creta in Earth Brown Color Variant. 2018 Hyundai Creta is made available in Brown Color (Earth Brown). Bring on the dusty look, but not really dusty. Here is the Hyundai Creta in Star Dust Color variant. Above is the photo of 2018 Creta in Star Dust Color Variant. 2018 Hyundai Creta is made available in Star Dust. Here is the new color variant with Dual Tone which makes the Hyundai Creta distinct and existing. Hyundai Creta in Polar White Dual Tone Color variant. Above is the photo of 2018 Creta in Polar White Dual Tone Color Variant. 2018 Hyundai Creta is made available in White Dual Tone (Polar White Dual Tone). Here is the new color variant with Dual Tone which makes the Hyundai Creta distinct and existing. Hyundai Creta in Earth Brown Dual Tone Color variant. Above is the photo of 2018 Creta in Earth Brown Dual Tone Color Variant. 2018 Hyundai Creta is made available in White Dual Tone (Polar White Dual Tone). Get Hyundai Creta for Test Drive! Provide your details so that we can arrange a test drive of Hyundai Creta for you at your city! Which is your color preference?